Stay in the Manor You're Accustomed with FREE WIFI, FREE Light Breakfast and FREE onsite parking. Converted from a large private residence the Princes Lodge Motel offers an unique place to stay in cosmopolitan North Adelaide, only 2 kilometres from Adelaide's city centre. With rooms to suit the independent traveller, couples and small groups. All guests can relax with a free light buffet style breakfast in our dining room overlooking the Adelaide Parklands each morning. Large room in Main house with ensuite. Queen Bed and 2 single beds. Rate is for up to 4 guests and includes buffet continental breakfast in dining room. Printing of documents. Faxes sent and received. Fees apply. Wifi internet available FREE throughout the Motel. A free Interenet Kiosk PC available for use. Reception hours are 700am to 700pm. If you will be arriving outside these hours please contact us to arrange motel and room access. Extra Guests $30.00 per night where rooms allow. Children under 2 free if own cot bedding provided by guest. Otherwise $10. Limited car parking available on site free of charge on first come first served basis. 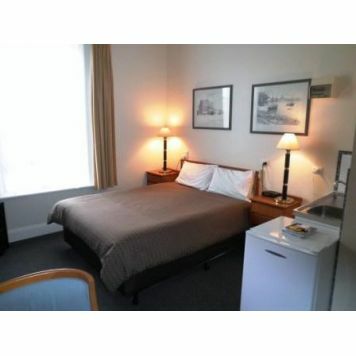 The motel is located at 73 Lefevre Terrace North Adelaide South Australia. We are on google maps - "Princes Lodge Motel North Adelaide SA"
Taxi is approx $30 and takes about 25 minutes (35 mins in busy traffic). Jetbus from terminal to city then change for a local bus to O'Connell Street. Alight in O'Connell Street and walk east along Tynte Street to the end of the street and turn left into Lefevre Terrace. The motel is 100 metres from the corner. Lefevre Terrace runs parallel to O'Connell Street. Travelling North from King William Street in the city the road changes name to O'Connell Street as it goes up the hill turn right into Tynte Street, travel to the end of the street and turn left into Lefevre Terrace. The motel is 100 metres from the corner.